A proper duplex in downtown Andrews, South Carolina! Development opportunity. Great visibility at major intersection of S. Pine St. and Country Club Rd. Opportunity Knocks!! One of a kind investment property that is unique and profitable. 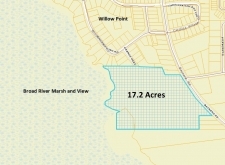 One Acre Lot on Hwy 378 at the entrance of the Horry County Airport. GREAT LOCATION! 4800 Square feet of retail/office property.